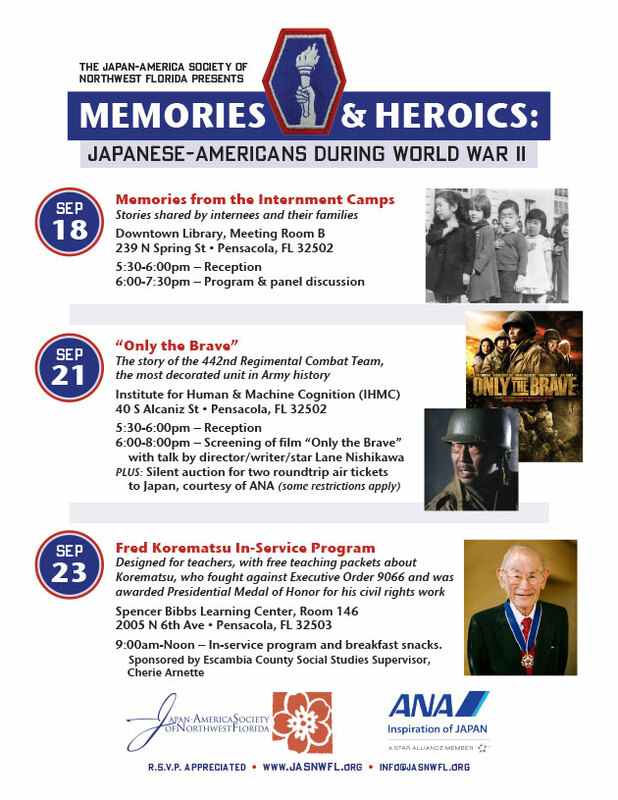 “Memories from the Internment Camps” is a panel discussion where Japanese-American internees and their family members will discuss their experiences. This year is the 75th anniversary of Executive Order 9066, which created the internment camps where Japanese-Americans were detained during the war. The program will take place on Sept. 18 at the West Florida Public Library’s main downtown branch (239 N. Spring St.) in meeting room B. A reception will begin at 5:30 p.m., and the program will take place from 6:00 to 7:30 p.m. Both programs are free and open to the public, but reservations are requested. R.S.V.P. on Facebook, Eventbrite or the J.A.S. website, www.jasnwfl.org. Finally, a free in-service program for teachers will be held on Sept. 23 at the Spencer Bibbs Learning Center (2005 N. 6th Ave., room 146) from 9:00 a.m. to noon. Free teaching packets will be made available courtesy of the Fred T. Korematsu Institute. Korematsu was a civil rights activist who challenged the constitutionality of the Japanese internment camps and who was later awarded the Presidential Medal of Freedom. Breakfast snacks will be served during the program.